When I lived in Western Pennsylvania, football was easy: I was living in Steeler country. But when I moved to Oregon, that clarity was gone. Was I a Duck? Was I a Beaver? The rivalry is real, even for those of us who have no idea if its football, basketball, or baseball season. So, it’s a good thing its always running season. Rivalry Clash events are perfect for the runners and walker who know if they bleed orange or green. This November you have the chance to earn glory for your team by putting your feet to the trails in Tualatin on November 11th. 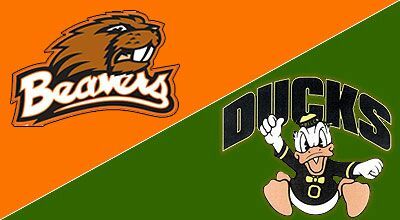 The 6th annual Duck vs. Beaver Rivalry Run includes half marathon, 10k, and 5K distance options. And a cross country scoring process to determine who runs faster: Ducks or Beavers. Finish place and time matters! The lower the better. The top 10 finishers from each team in each race will score the number of points equal to their finish place, just like a cross country race. For example, if you finish 1st place, you score one point, if you finish 10th place, you score 10 points. A perfect team score/sweep is 1+2+3+4+5+6+7+8+9+10 for a lowest possible score of 55! No matter your placement in the event, the post-race party will include vendors, music, prizes, and enough bragging to keep you busy until the next showdown. In the meanwhile, this Platypus will see you on the run. When: Sunday, November 11th. Half Marathon @ 8:30am. 5K and 10K @ 8:45am. Packet Pick-Up: November 10th from 11am to 3pm at Road Runner Sports or Race Day. Cost: Half Marathon @ $60. 10K run @ $40. 5K run or walk @ $30.